As you can see from the diagram, there is a fair bit more to astrology than just know the zodiacal placement of the Sun, as in “Hi baby, I’m an Aries. What’s your sign?” which means the Sun was in the sign of Aries when you were born and that only tells you part of the picture. In a natal chart there are 10 significant heavenly bodies: Sun, Moon and 8 planets (Earth excluded)…no make that 7 planets and one that was formerly known as a planet. There are 12 signs. There are 12 houses, each of which represents a different facet of life. I will examine the relationship of the planets to each other, which sign they are in and within which house they reside. From this, I can tell a person about her parents, her siblings, the men she attracts and why, how she thinks, if she will be religious or spiritual, and how the person will handle money. Even a person’s face and body shape can be derived from the chart. Again, it is up to the person to decide how to manifest their potential. The study of astrology dates back thousands of years as our species looked to the sky and started to notice connections between the alignment of the stars and events on Earth. At the moment you took your first breath, the planets were in a particular alignment. They somehow left an imprint on you. You can even think of it as the Divine’s DNA for your life mission. Several societies used astrology from the Babylonians to the Indians to the Greeks, Egyptians and Romans. During the dark ages, the Arabs made strides in the art. In the Renaissance, most people of nobility had a personal astrologer. One of the most famous astrologers from this time period was Nostradamus. Another astrologer by the name of John Dee was Queen Elizabeth I’s personal astrologer. Science and Astrology at that time went hand in hand – Sir Isaac Newton could cast and interpret an astrological chart. Astrology is not the sun sign horoscopes that you read in magazines or newspapers. Astrology is a personal snapshot of you. It can indicate what issues you have and will be facing as you cycle through your life. It is a great tool for understanding yourself, family and friends. The branch of astrology know as Horary is based on the similar premise as the natal chart, except that instead of dealing with the birth of a person, we deal with the birth of a question. The chart is then judged according to various rules of Horary astrology. The master of Horary Astrology is a gentleman from the 1600’s by the name of William Lily, who wrote his famous text Christian Astrology which is still referenced today. Unlike Tarot and Runes, astrology is more about interpreting the chart rather than using psychic ability. There is some preparation involved after getting your information: month, day, year, place and equally important exact time. 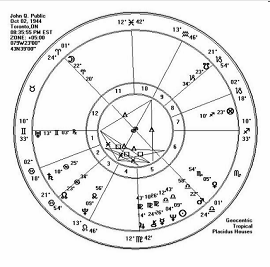 I will cast the chart and other charts which represent where the planets are at this point of time such that we can look at the past, present, and future. The accuracy of event timing will be based on the accuracy of the person’s astrological data. From the chart all the information about career, money, love, health and children can be seen in the chart. What is important though is that issues or positive happenings can be predicted from the chart and how long events will last can be determined. Major life shifts appear in the chart from job changes, marital difficulties and even moves. Readings include an mp3 recording.